Every once in a while we analysts have an epiphany that rings a bell on one side of the brain while shouting out a giant “duh” on the other. That’s part of the bipolarity of what we do: sometimes the most startling revelations are the ones you’ve seen a dozen times, until finally that bell goes off, even as you realize that you really should have had that revelation a few months earlier, if only you had been paying attention. So it goes with my recent revelation about the mobile platform as the design center of the enterprise. Because the more I think about it, the more I wish I had thought about it sooner. Now that the enterprise software market is well on the way to shifting the bulk of its efforts in this direction, there’s a big fat caveat emerging that could take a lot of the excitement out of the shift to the mobile metaphor: the potential for a market freeze as the growing expectations of mobile user experience nirvana come up against the harsh reality of a paucity of apps that leverage this opportunity. Because, despite all the hype and promise, it’s going to take years for the enterprise software market to meet the expectations it is now so avidly sowing, at the risk of reaping the proverbial whirlwind instead. My revelatory moment started with Workday asking the analysts at a recent summit to test-drive their new HR management iPad app. The app was way cool, and started the brain waves flowing. Next up was my stint judging the gamification Innojam at SAP’s TechEd. As my fellow judges and I watched the contestants show off their stuff, the contrast between the gamified interfaces – most of them built with a mobile platform in mind – and the “old” SAP screens was almost shocking. Then came the fact, as I reported from TechEd, that the mobile experience is the design metaphor for SAP going forward. 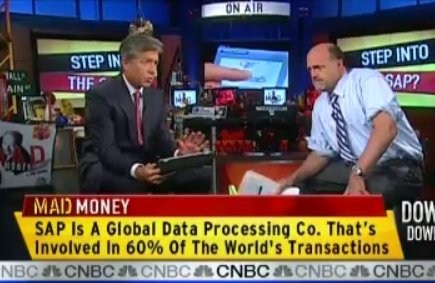 And the kicker came when I watched SAP CEO Bill McDermott, being interviewed on Jim Cramer’s Mad Money show, pull out his iPad and show how a CEO like Bill can run a company like SAP. Rinnnnggggggg…. It was a masterful performance by McDermott, and one that showcased how SAP’s thinking is ahead of the market (and me, duh.) But the combination of the above revelations also highlights an important conundrum: for whom does this ringing in my ear toll? The conundrum for McDermott, and his counterparts across the industry, even newbies like Workday, is that this mobile metaphor – okay, let’s call it what it really is, the iPad metaphor – is so compelling, so visually and tactilely immersive, that it threatens to run away with market. Or at least the market’s expectations. I have been doing a minor in user interface design during the last few years, and it’s amazing how quickly the iPad has made the huge investments in user experience guidelines by everyone in the enterprise space – Microsoft, Oracle, Salesforce.com, as well as SAP, Workday and others – look like yesterday’s green screen. How do you keep them down on the desktop once they’ve seen Bill run his business on an iPad? It’s true that there are many many things you can’t do on an iPad that you can do on a PC, but hey, that’s beside the point. It’s the same as with that former enterprise software metaphor of the hour, Amazon: I can’t begin to tell you how many times the simplicity of the Amazon user experience has been touted as the defining user experience for the enterprise, despite the fact that Amazon’s user process has maybe seven sub processes (find, add to cart, ship, buy, return, report, review) while a real business process would typically have dozens. Try telling that to the user – especially a member of the up and coming iPad generation: sorry, wrong number, dude. Which is why there’s not a small amount of danger in the expectations that McDermott, or Workday, or every other enterprise software company with a well-designed mobile app are setting for the market. If McDermott says that I can now run my company from my iPad, then by gum he better give me that software. And while it’s good that I, the CEO, can run my company this way, it would be even better if all my managers could run their divisions this way. And pretty soon, the drum beat is demanding that SAP and its cohorts make it possible for every user in the entire company to run their show on an iPad. Whereupon something horrid happens: the enterprise software market stalls, waiting for the next best thing to be available, in this case an across-the-board user experience that will take years for the market to deliver. It’s like declaring that a Y2K-like software refresh is around the corner, but it won’t be until Y2.5K that the industry can deliver a solution. Slam on the spending brakes. Of course, it doesn’t have to be that way. If expectations are set well, both for what is actually possible from a design point – as in, how far can the iPad metaphor go before it loses its user experience advantage – as well for what is a reasonable roadmap for moving the mobile metaphor across the industry, then perhaps the stall can be avoided. But those expectations need to be set soon, because a drum beat is being heard across the industry that may threaten a lot of good companies and their products. That’s the problem with setting expectations too high. You never know when the mob that’s cheering you in the streets will suddenly start demanding your head.